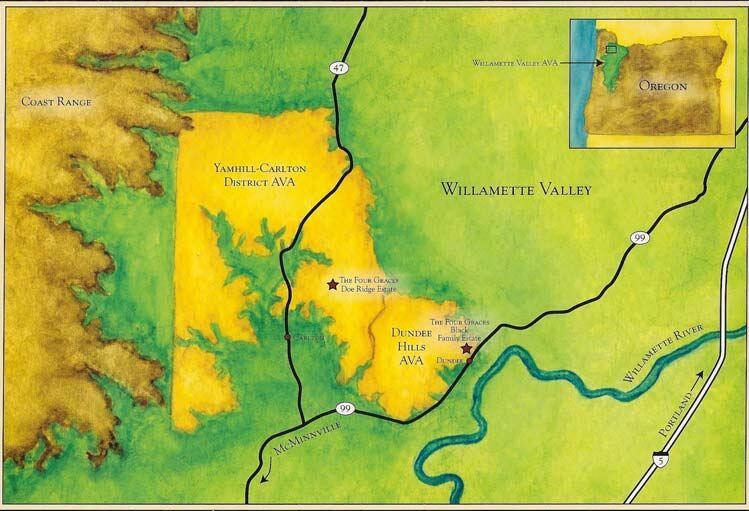 Steve and Paula Black bought a 110-acre property in the Red Hills of Dundee, and with the guidance of renowned winemaker Laurent Montalieu, created The Four Graces, named in honor of the Black’s four daughters, Alexis, Vanessa, Christiana, and Julian. Brother Nicholas is The Keeper of The Four Graces. The goal was to start a family business that could be left as a legacy to the Black’s children. 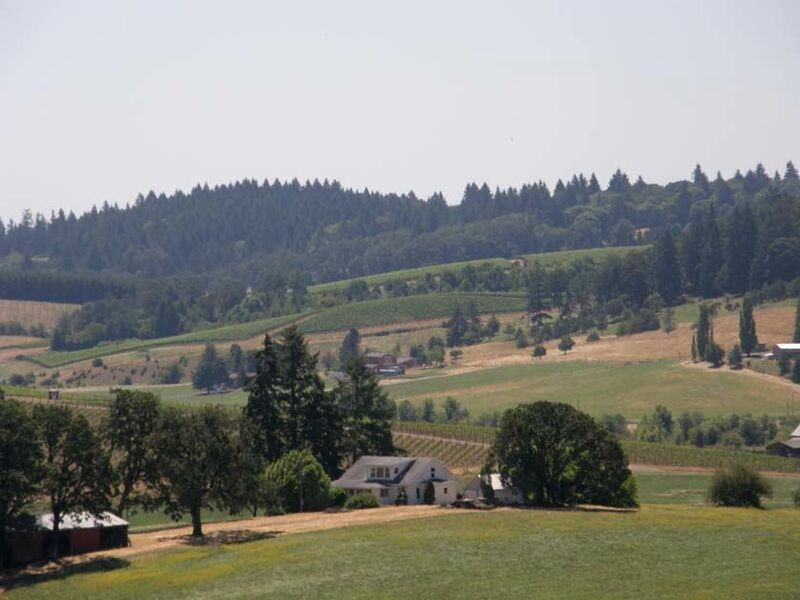 Last year I visited the owner’s Doe Ridge Estate Vineyard, a 90-acre site in the Yamhill-Carlton District acquired and planted in 2005 (see report in the PinotFile, www.princeofpinot.com/article/577/). The vineyard at this exceptional site, which had been neglected and devastated by phylloxera, was completely replanted to launch a unique project. Two 20-acre parcels divided by a natural habitat ravine were planted to the same clones (Pommard, Dijon 115, 667, 777) and rootstocks (101-14 and Riparia Gloire) at 2555 vines per acre (1.9m x 1.0 m spacing). One parcel is farmed according to the Rudolph Steiner practice of Biodynamie under the guidance of French consultant, Philippe Armenier, and the other is farmed according to LIVE sustainability guidelines. Noted viticulturist, Matt Novak of Results Partners LLC Vineyard Development & Management directed the planting and oversees management of the vineyard. Laurent Montalieu has crafted the wines from this property, duplicating the winemaking from the two parcels, and the first wines now allow for early comparisons of the two parcels. This is the largest experiment of its kind in the world. Pictured below is the Doe Ridge Vineyard in the distance photographed from a more northerly hill at Lenné Estate. The riparian divide with stream is evident in the center of the two parcels. 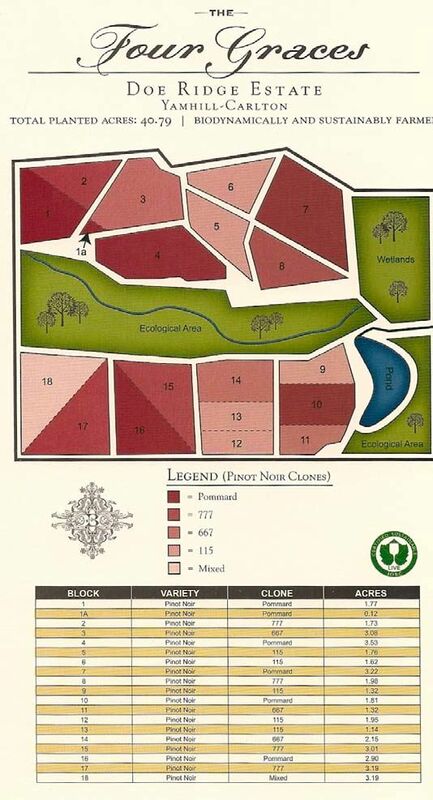 Also, the location of the vineyard and its layout are depicted in the schematics below. I visited The Four Graces recently after IPNC and sat down with Matt Novak and General Manager Anthony Van Nice to blind taste wines from the two parcels of the Doe Ridge Vineyard from the 2008 vintage (bottled samples) and 2009 vintage (barrel samples). The grapes for both wines were picked within 48 hours of each other, the clones are the same, and the wines received the same new oak treatment for 14 to 16 months. The wines from the two parcels were difficult to distinguish, especially from the 2009 unfinished wines, but there were subtle differences evident. Anthony and myself preferred the biodynamically-farmed wines in both vintages, while Matt preferred the biodynamically-farmed Pinot Noir in the 2008 vintage and the sustainablyfarmed Pinot Noir in the 2009 vintage. Obviously, many more tastings like this by experienced tasters will be necessary to discern any significant advantages of one form of farming versus the other. 2008 The Four Graces Doe Ridge Vineyard Sustainable sample Dark fruits are featured on the nose including blackberries and black raspberries and plums with a savory undertone. The flavors echo the aromas. Very tasty with an earthy underpinning and very fine ripe tannins. Pleasant but not lengthy finish. 2009 The Four Graces Doe Ridge Vineyard Biodynamie barrel sample Youthful and undeveloped but with demure fruity notes of dark raspberry and strawberry on the nose with hints of smoky oak and vanilla. Richer and riper than the 2008 with primal cherry cola flavor. Soft in the mouth with admirable mid palate force and fine grain tannins. Preferred. 2009 The Four Graces Doe Ridge Vineyard Sustainable barrel sample Aromas of raspberry and strawberry fruit with hints of smoky oak and mint. Leaner and redder than the biodynamie sample with more earthiness. Still linear with plenty of oak and tannin to shed. Since 2007, The Four Graces has bottled and sold a Doe Ridge Vineyard Pinot Noir composed of Pommard grapes from the entire vineyard. 2007 The Four Graces Doe Ridge Vineyard Willamette Valley Pinot Noir 13.5% alc.. (tasting room item, nearly sold out). Tasted briefly. Aromatically pure and uplifting with lovely cherry and red berry highlights and a hint of herbal oak. Tight-knit core of lovely red fruit flavors with fine, sandy tannins and perfect balance. Very good. 2008 The Four Graces Doe Ridge Vineyard Willamette Valley Pinot Noir Bottled 3 months, unreleased. Similar hi-tone aromatics of the 2007 vintage with enticing scents of cherries, berries, cola and oak. Beautifully composed essence of ripe fruit displaying discreet richness and staying power on the fruity finish. Should have tremendous potential over time. Very good. The Four Graces tasting room is a charming small house beautifully landscaped in a peaceful setting just off Highway 99W in Dundee. The address is 9605 NE Fox Farm Road. The hours are 10:00 to 5:00 daily. You will be suitably entertained and warmly received by Aussie Jason Senior, the tasting room manager. The winery’s other offerings, including Pinot Gris and Pinot Blanc, are first class. 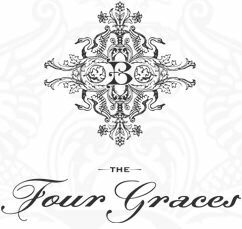 Visit the website at www.thefourgraces.com.